New technologies and frameworks seem to be popping up every day. But one of them in particular seems to be sticking around for a lot longer, and in fact, growing in popularity. But as developers, we're playing in an ever-changing and fast-paced environment. Learning new technologies is a must — otherwise some up and coming kid out of a coding bootcamp might come and eat your lunch. You don't want to be left behind do you? At the same time, you can't be plagued by shiny object syndrome, because not all technologies stick around and capture market share. In today's post I'm going to share why it might be time to bite the bullet, swallow your disbelief, and think about using TypeScript. You might be surprised at the similarities between Java and TypeScript. Okay, okay, let me explain why that's actually a good thing. There's no hand waving or guessing around, "does this object have this attribute or method?". From a developer's perspective, that means that she has to now check the entire flow from when the object was created to where it's now being used. Not really a great use of time, but you kind of have to do it to prevent bugs. Now, multiply this across an organization. Engineers are adding features, refactoring, and fixing bugs, and they're checking and double checking each time they make a change . A trivial check they would get for free with a statically typed language. Let's face it. This is no way to sustainably scale your codebase with engineers tripping over themselves. With TypeScript, you don't have this issue. Just inspect into the class, et voilà, you'll have your answer. Because it's a typed language, even a text editor like Visual Studio Code starts to feel more like an IDE. As Java developers, we're spoiled by Intellij IDEA's fancy features. Code completion, quick definition lookup, and one-click refactoring isn't something you normally get from a text editor. And those features are really hard to live without. But with Visual Studio Code and TypeScript you'll feel right at home. You'll be jumping into files, refactoring code, and the only thing you'll notice other than the different keymap is the cleaner look . Yep I said it. And grab yourself this theme while you're at it. You deserve it. I won't tell you why. I'll show you why. Look at the docs for Spring Boot: arguably the fastest way to set up a Java Web Application. To the uninitiated, what does this mean? Beans? Classpath? DispatcherServlet? Huh? What year is it again? Why do I have to learn Gradle for a trivial "hello world" guide? Wait — Maven? Do I learn Maven or Gradle? Oh no…do I need to learn both? Meanwhile, look at the expressjs docs. One self-contained example. 5 lines of code. And they even give you a runkit notebook right on the page for instantaneous feedback! With TypeScript, you get all that expressiveness with the productivity of your developer tooling that you've come to expect from Intellij IDEA. You're literally flying along at lightspeed while the Spring Boot docs are still mumbling incoherently about "traditional WAR file deployments" and "bean configuration". As Java guys we know and love the power of working with a statically typed language. But did you know that statically typed languages also leads to a lower incidence of bugs? They looked at public bug reports and concluded that 15% could have been prevented! The results are encouraging; we found that using Flow or TypeScript could have prevented 15% of the public bugs for public projects on GitHub. 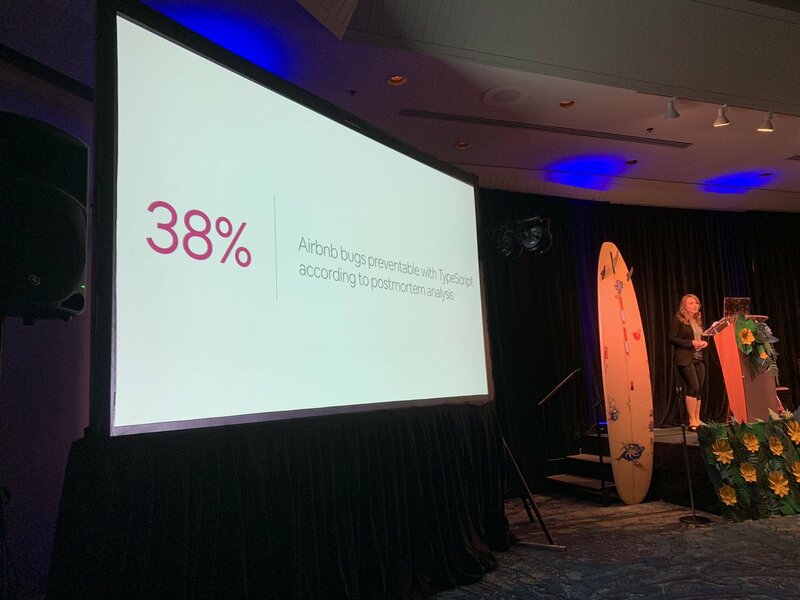 AirBnb recently gave a talk at JSConfHI and found that according to a postmortem analysis, 38% of bugs were TypeScript-preventable . You know, I wasn't too sure about TypeScript either. But I took the plunge, came out on the other side and I'm really liking it. It has types, fits into your existing workflow, and it's way more expressive than Java. But don't take my word for it. Try it yourself and I'll see you guys in the next post! I always found this terribly ironic. Why is it that we proclaim bold innovations by dynamically typed languages in their freedom and expressiveness, only to circle back around and add type checking a few months later? What does this mean for you and me? Dynamically typed languages are a safe bet for hobby and small projects. But it's a nightmare when you have multiple teams working on the same code base without type checking. DX is critical to velocity and your IDE/text editor plays a key role. If you're working in a language where you can't cmd + click into a declaration, you're wasting brain cycles. Because now you have to global search. And what happens when you do that? Unnecessary context switching to parse through search results. Your search comes back with 3-4 results. So you context switch a few times before finally finding what you wanted. Add this up over the course of a day, and multiply it across your organization. Yikes. That's a lot of wasted cycles.